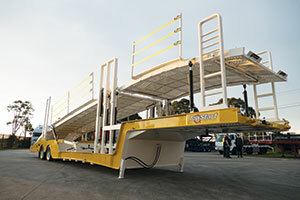 Having been in business for more than 30 years, TopStart Trailers has built a sound reputation for producing a range of innovative car carrier, curtain-side and flat-top trailers. The company has standardised on Fuwa K-Hitch (FKH) running gear including axles, suspension, turntables, king pins and landing legs. The history of TopStart Trailers dates back to the mid-1980s when Peter Bouzinelos, an engineer originally from Europe, was running his own transport company in Victoria. He was having so many problems with damage to cars caused by the poor designs of car carrier trailers built by other companies that he decided to make his own. After being told by several sources that his design was impossible to manufacture, Peter put his engineering expertise to the test and, in his own backyard, built the first eight-car transporter with the ability to transform into a flat-top trailer for carrying containers. His design proved well up to the task and reputedly saved his company thousands of dollars in car repairs and is said to have provided an estimated 60 per cent improvement in loading times. From there, it seems, the die was cast and TopStart Trailers commenced operations. 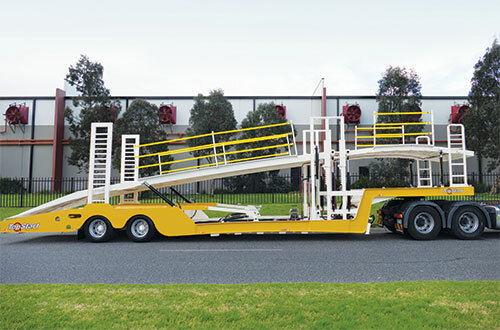 Over the ensuing years the company has forged a reputation as one of the pre-eminent specialised trailer producers in Australia, manufacturing a range of trailers from car carriers to curtain-siders, drop-decks and flat-tops. With an emphasis on quality and durability, the company uses high tensile steel to ensure maximum strength combined with optimised tare weight. These days the company operates from a large-scale factory in Dandenong South. Peter’s son, Jimmy Bouzinelos, is the Operations Manager. Jimmy has worked hard with his father from a young age. Any trailer is only as good as the running gear keeping it rolling, and in this regard TopStart Trailers has for a long time relied on Fuwa K-Hitch. According to FKH Regional Sales Manager, Diaa Bishara, FKH has been supplying the trailer builder with its VDL and KT air suspension systems with eight- and 10-stud drum brake axles, complete with anti-lock braking system (ABS), auto slack adjusters and axle lifts (if required) for around 10 years. “The VDL is an air suspension system that allows flexibility for TopStart Trailers when fitting our full range of axle sizes including 17.5- 19.5- and 22.5-inch drum and disc brake variants,” Diaa says. “We weld and assemble the suspensions to the axles at the nominated chassis rail centres at our factory in Derrimut, as well as pre-install equipment such as ABS pole wheels, sensors, brake boosters, and automatic slack adjusters. 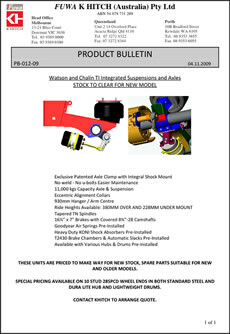 Diaa mentions that FKH also supplies TopStart Trailers with a number of other Fuwa products including landing leg sets, spring brake boosters, skid-plate and ball-race turntables, drawbar kits and tow eyes, which he says makes life as easy as possible for the company from a supply perspective. “This is achieved while offering extremely competitive pricing and what we believe are industry-leading stock availability and production turnaround times,” Diaa stresses. It’s a service that Peter Bouzinelos is happy to endorse as he describes the strong partnership that has developed between TopStart and FKH over the last decade or so. “Around 90 per cent of our trailers are now specified with FKH components,” Peter says. “They’re good products and the people at Fuwa are easy to deal with, which are the primary reasons why I’ve stuck with them. Peter says TopStart trailers are designed and built to last, just like the FKH components that are integral to the build. He points out that due to quality manufacturing procedures and innovative designs, many TopStart trailers that were built two to three decades ago are still being worked hard and earning good money for their owners. To this end, Peter says he has standardised on the heavy-duty 11-tonne rated FKH drum brake axles and suspension to ensure ultimate durability. Peter agrees that this might be considered by some as over-engineering, but says ultimate durability and productivity are the principles upon which TopStart Trailers was founded. Fast Fact: FKH says generally it can have the components to its customers within five to seven working days after ordering, giving them greater flexibility in planning their own production schedules.